Mobile advertising for PPC (pay-per-click) can be painful at times, as mobile campaigns frequently don’t convert at as high a rate as do desktop campaigns, and finding conversion attribution on mobile can be difficult. Although it’s difficult, it doesn’t mean it’s impossible. And lucky for you, I’m sharing seven tactics that the digital strategy team at Zion & Zion often use and that will help you improve your mobile PPC conversions. This should be a no brainer at this point in mobile advertising as AdWords and Bing Ads have started to penalize accounts who are giving customers a bad mobile landing experience. If you want to increase your performance on mobile and you don’t have a mobile friendly site, then you should either build one or strongly advise your clients that they need one. Without a mobile friendly site, your campaigns are going to suffer significantly. AdWords and Bing Ads are going to penalize your quality score, potentially decreasing your positions, and increasing your costs. Making it more expensive for you to advertise. On top of that, your conversion rates will suffer as you will have high bounce rates and, most likely, terrible conversion rates on mobile. Without a mobile friendly website or landing page, I recommend that you opt out of mobile within your device settings, adjusting your mobile bid modifier to -100%. If getting a mobile friendly site for your client isn’t feasible, another option would be to try alternative methods of advertising where the conversion happens right on the search page, like using AdWords Call-Only campaigns. Call-only campaigns and call extensions allow for phone call conversions to be made directly on the search engine results page. These campaigns will either place the phone number in the headline or add a call button next to the ad, allowing the customer the ability to click from their mobile device to call. Call-only campaigns are for mobile devices only, allowing you more control over bids on the keyword level than a regular campaign would. I have several clients in the home services industry where phone calls are the lifeblood of their business. My team and I have seen a lot of success with running these ad formats as we eliminate one step in the conversion process which helped increase conversion rates. If your conversion is an email sign up or you have an ecommerce site, I advise that you ask your clients how well they do with converting on the phone as this may be an opportunity to close the conversion loop. If your client does make sales over the phone, you can use call extensions and call-only campaigns to help boost sales on mobile devices. When doing so, you’ll want to add an event and conversion on your website to track any phone calls that came from your ads by using a call tracking number and setting phone number clicks as a conversion. 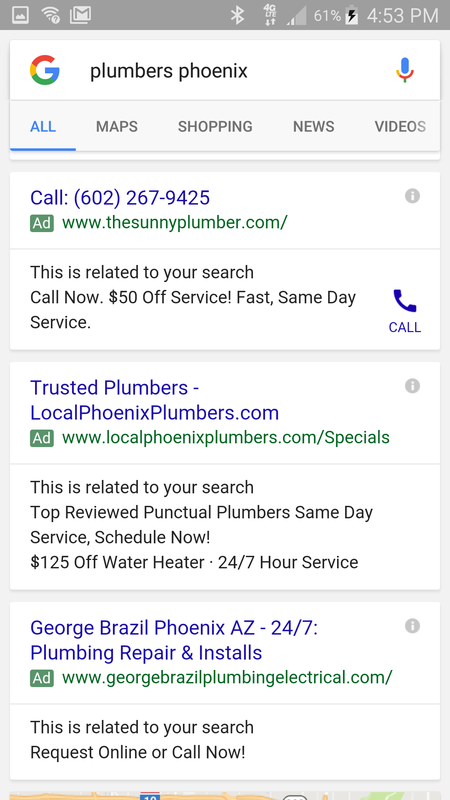 If you are advertising for an app, you can use the app extension to have users download your ad directly from the search engine result page (SERP). If your client has a brick and mortar location, you should be using location extensions as part of your paid search strategy. Location extensions include location, address, phone number, and other business information, such as business hours of your closest store—this helps drive customers to that location. A good portion of mobile users are using their device while they’re out and about. So, if a customer is looking for a product that your client sells, why not let them know where they can stop in and buy it? Many digital advertisers refrain from pushing customers toward in-store purchases because more often than not the conversion or sale will not get attributed to their marketing campaign. But try thinking about it from the client’s point of view. From that perspective, a sale is a sale which means more money in their pocket. A good strategy to use with location extensions is to set up geo-targeting around each location, then apply a bid-modifier to increase your bids for customers who are close to your area of business. Location extensions can be easily set up as long as you have access to the client’s Google My Business account. Mobile users differ from users interacting with a computer or tablet. So why would you try to reach them in the same fashion? Many users on mobile devices have shorter attention spans because they’re typically looking for quick information while they are out and about, doing research on a product, or are in desperate need for a service. One recommendation while testing ad copy for mobile is to shorten the length of your copy. Try getting straight to the point by giving the user the information they’re looking for in less characters and by adjusting your display URLs to include elements like “mobile-site” or “mobile.” Also, be sure to set up relevant ad extensions. If these happen to appear with your ad during a search, it allows users to have access to more of your business’s information. The only way to bid specifically on mobile at the keyword level is if you’re using call-only ads. However, if the goal of your campaign is not to get phone calls, then your only current option is to change your mobile bid and use the bid modifier found within device settings. 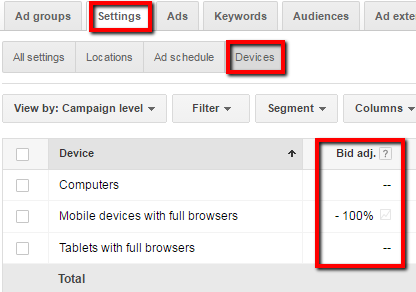 Currently, you can only adjust your mobile bid at the campaign or ad group level from -100% to 300%. Google recently announced that they are going to implement bid modifiers for desktop and tablets in the coming months. This will allow advertisers to set up mobile only campaigns in the future by using a -100% bid modifier on computers and tablets. Once a user clicks on your ad from a mobile device, your website or landing page must do the job of converting your users. As we know, this is not as simple as it sounds as mobile last-click conversion rates are usually pretty low. One thing I recommend is simplifying the path to conversion. Give the user what they want and make it easy for them to get it. If your business or client accepts phone calls and secures conversions over the phone, make the phone number on your landing page stand out and easily clickable. 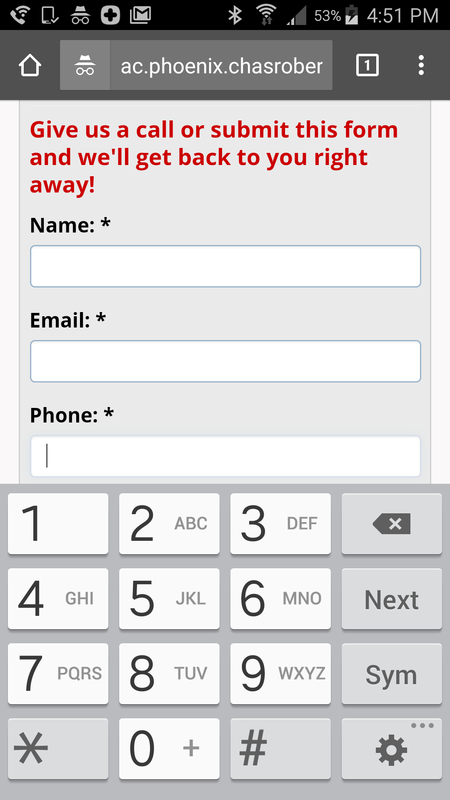 Try using a ‘call now’ button so the user can access the phone number easily. Another quick adjustment that you can make on your website to help improve conversion rates is to optimize your form fields. This was something Bryant Gavin talked about while he was speaking at a conference. The first is to have a developer change the input type for any form field on your website that requires a number to be typed in, to equal “tel”. This will pull up the number keyboard when these fields are selected, allowing the user to easily type in their credit card information or telephone number. Second, you should make the input type for anywhere you require the user to type in an email address equal to “email.” These simple updates on your site or client’s site will help to improve your mobile conversion rate. Another opportunity to take advantage of regarding mobile advertising is users that are traveling, especially if the industry you work for is affected by tourism. This could include restaurants, museums, or any type of tourist attraction. People vacationing to a new place are always looking for something to do or a local place to eat, and usually their main tool for finding this information is their cell phone. One tactic that may help you take advantage of this is geo-targeting hotels and airports around your business to increase bids around that area. You can target airports directly under the geo-targeting settings, but there is no option for hotels, so you may need to get creative and look for the addresses yourself. Most of the mobile paid search tactics provided within this article are relatively easy to implement if you’re a seasoned pro. This means that improving your mobile PPC campaign is achievable, but takes work. To sum up, use ad extensions to help your mobile campaigns, improve your website to give your mobile users a better experience, and strategically use geo-targeting to improve your mobile results.